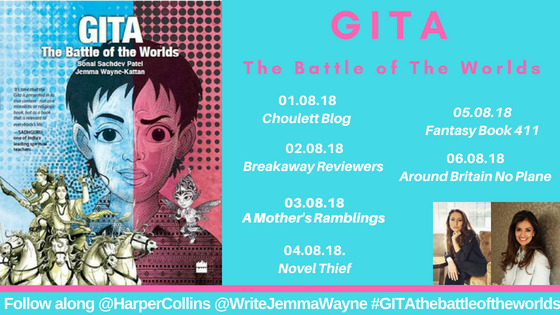 A Mothers Ramblings: GITA The Battle of the Worlds Book Tour! I have mentioned numerous times, that here at A Mother's Ramblings we are a house of readers. Top Ender at her recent Parent's Evening was called a Bookworm by her Maths teacher, that's how often she has her nose in a book. Poor old Dan Jon has to suffer the embarrassment of being singled out in Assembly when he reaches a new reading milestone (the same ones each year) with the Headteacher normally saying something like; "And who can guess who is the first person to have read X times this last School year?" and all the children raise their hands to volunteer his name, as they know he is the only one to have read so much to have reached the target so quickly. And me? Well, Books are like air to me, I need to read at least one chapter a day (who am I kidding, it's more like one book a day) and am well known, in our house at least, for reading shampoo bottles in the shower if I've been in there too long and am starting to get withdrawal symptoms. When we were asked if we would read GITA The Battle of the Worlds, by Sonal Sachdev Patel and Jemma Wayne-Kattan, I said yes and a copy was soon sent along for us to read. As I was here when the post arrived, I got first dibs and I started reading the story about a young man called Dev who is suffering and suffering badly. The story has Dev finding a small sprite-like creature called Sanjay in his room after a horrid moment when Dev was mean to his younger brother and lashes out in grief, which is manifesting in anger, resentment and a whole lot of other negative feelings. Sanjay tells Dev that in his body a battle where Prince Ego is trying to take control is happening, but offers to venture inside to find a great warrior called Arjun to ask him to fight for Dev and to control Ego. I am sure that this story is based on one I read within Hindu teachings, (it is) and I was really interested to see how the children reacted, not only to the story but to see if they were aware of this battle inside of them, seeing themselves as only "I" or seeing themselves as a part of something more, a self-realisation I guess. Both of them got the story about how this applies to them, about how when our Ego goes unchecked it makes us horrible human beings and how maybe Yoga would be good for them to practice to allow them time to centre themselves each day, before realising that the time they spend each day in private prayer is a similar process... not bad for a book that is under 100 pages long. The illustrations in the book, by Soumitra Ranade are brilliant and have inspired a lot of Mandala drawings in our house, and a lot of discussion on chakras and how they may look when Ego is checked. I'm just glad that I have a love of Religion as, otherwise, some of the conversations my children are having over this book may have gone over my head! It isn't essential however, the story can still be enjoyed without fully understanding the religious aspects of it! I think that this book is perfect for those aged between 9 and 14 as an introduction to other world teachings, but also to allow the child a chance to understand the battle that is raging on within themselves and how they are the only ones that have any chance of stopping it. Who knows, maybe if we made this mandatory reading, the stereotypical teenager will be a thing of the past! We were sent this book for free, it is going to be passed on to Dan Jon's School as I think that is where this book will do the most good.